Yuki beat second seed Spaniard Adrian Menendez-Maceiras 6-2, 6-4 in the first semifinals that lasted one hour and 39 minutes. 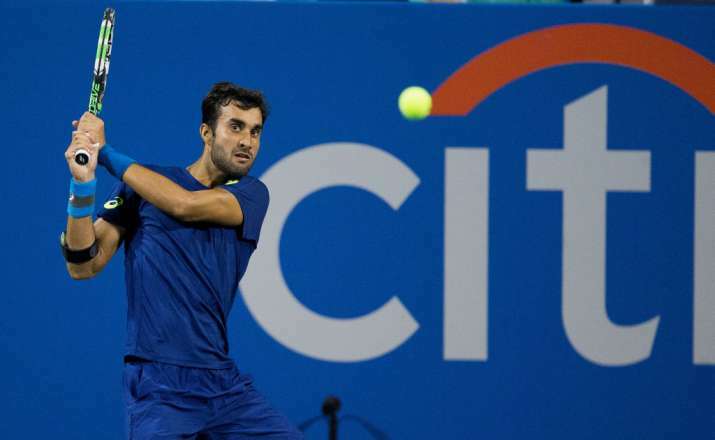 Third-seeded Yuki Bhambri will clash with Ramkumar Ramanathan in an all-Indian men's singles final at the USD 50000 KPIT MSLTA ATP Challenger. Yuki beat second seed Spaniard Adrian Menendez-Maceiras 6-2, 6-4 in the first semifinals that lasted one hour and 39 minutes today. Later, fourth-seeded Ramkumar Ramanathan won an all- Indian semifinals against wildcard and giant-killer Saketh Myneni 6-3, 6-2 in a 47-minute contest. 25-year-old former champion Yuki continued his fine form against his the 127-ranked Spaniard. Backed by the partisan crowd, Yuki began the Centre Court action on a high. After levelling 1-1 by holding serve, Yuki showed first signs of pushing the 32-year old Spaniard Menendez-Mace in the third game. Yuki managed to hold back two game points that the Spaniard gained, but fell short, allowing the Spaniard to prevail on the third count and trail 1-2. Thereafter, Yuki took control. With a hold-break sequence, he went on to win five games in a row including breaks in the fifth and seventh games to close out 6-2. The second set had Yuki jump to a 4-3 lead with a break, before going up 5-3. Both Yuki and Adrian were locked in a battle royale in the ninth game. Forcing six break points, Yuki had the Spaniard come back and hold serve, before returning to complete a 6-4 second set win and dispose of the last standing overseas player.